A dental experience that will leave you feeling right at home. Welcome to the dental practice of Angie S. Rhodes, DDS, where we provide quality dental care in a comfortable, inviting atmosphere. 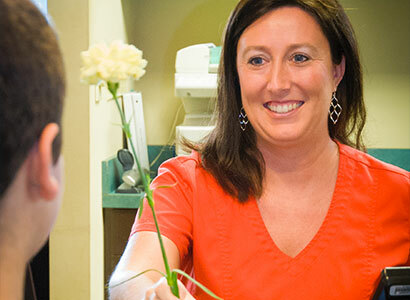 We are a family-oriented practice, and each member of our team plays an integral role in ensuring you receive compassionate care for your family’s dental health needs. 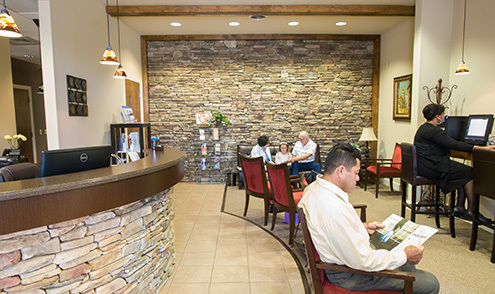 Part of making our patients feel at home involves creating a homelike environment. From the rock wall and exposed beams to windows in each room that overlook a beautiful courtyard that attracts a variety of birds, we’ve put great effort into helping patients feel at ease. We also offer heated neck wraps, pillows and blankets for patients to use during treatment. We enjoy focusing on preventive care in an effort to keep your teeth and gums healthy and avoid the need for extensive treatments. We also are here for you should you have a dental emergency, need a cavity filled, require a crown, or wish to make cosmetic improvements to your smile. 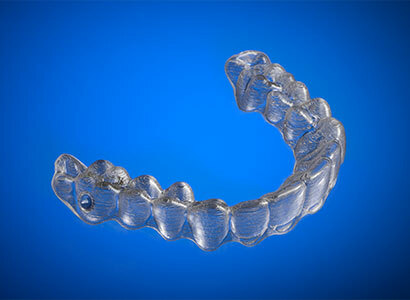 Dr. Rhodes is a Preferred Provider of Invisalign®, a teeth alignment system capable of making aesthetic improvements to your smile, as well as improving issues with your bite. 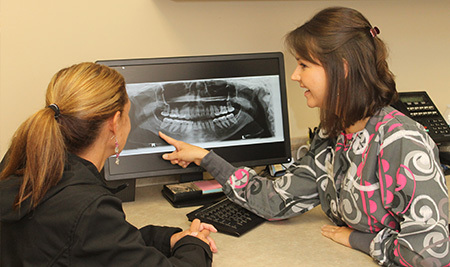 We invite you to learn more about our practice by exploring our website. If you would like more information or you wish to schedule an appointment, feel free to contact our office. We are able to assist you with insurance questions and financing options as well. Dental Internet Marketing by Prodentite.